If you have just found out that you are expecting not one baby, but two, you might feel overwhelmed and just a little (or a lot) scared, as well as happy. It is normal to be scared about expecting twins about your pregnancy and any possible complications, the birth, and about parenting two babies of the same age. Let's look at some of the common fears of moms who are expecting twins. The first thing is how your pregnancy will develop. Will you have more symptoms than singleton moms? Will you have to go on bed rest at some point? Just how big will your tummy become? 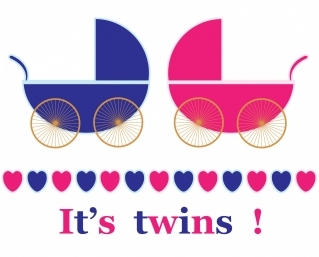 And what are the chances of twin-to-twin transfusion syndrome, where one twin gets too much nutrition and the other too little, will happen to you? The answers to these questions are different for everyone, and consulting with your OB is the best. Birth is always unpredictable. But if you're expecting twins, it is even more so. You might worry whether you will need a cesarean section or can have a vaginal birth. As long as your twins are in the optimal position, you should be able to deliver vaginally although it does depend on your doctor. There is a bigger chance you will have preterm labor when you have twins, but many moms do make it to term. Parents of twins say preparation is the key to handling life with two newborns. Plan ahead, and join a twin and multiple support group too. Twins are on the rise, so there is bound to be a group in your area. These ladies can help you with been there, done that advice and tell you what the most important things to plan for are. It is great to have some support from others who understand what you are going through, too. And you might make friends for life. Is there a Baby Crib for twins?